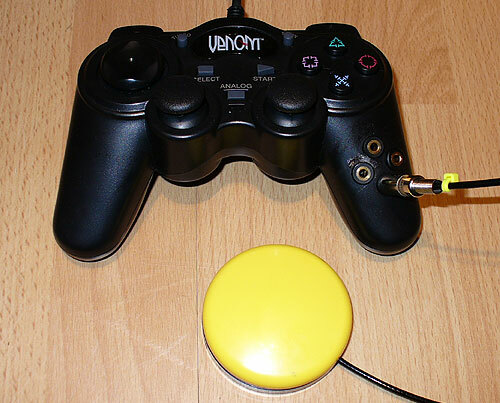 A Venom Playstation joypad adapted for accessibility switches to make gaming a little easier. Works on Playstation and PSone games and with an additional USB adapter with free utility JoyToKey can be used on PCs to play switch games (£5 extra). Share controls where one player uses switches and the other uses the joypad. Works with the majority of Playstation games using a Dual Shock controller. Enjoy some of the finest retro games available. Can be connected to a PC adapter making most one switch games playable. N.B. Switch access is to the shape buttons only. Plugging a switch into the "X" socket for instance can allow you to hit balls in golf games, make a car accellerate in race games and so on. Most games will still need someone to help set up menus and to take care of steering where needed. D.I.Y. Guide - Step by step guides for building your own Switch Accessible Joypad. C-SID - A fully switch accessible controller for almost all games machines.